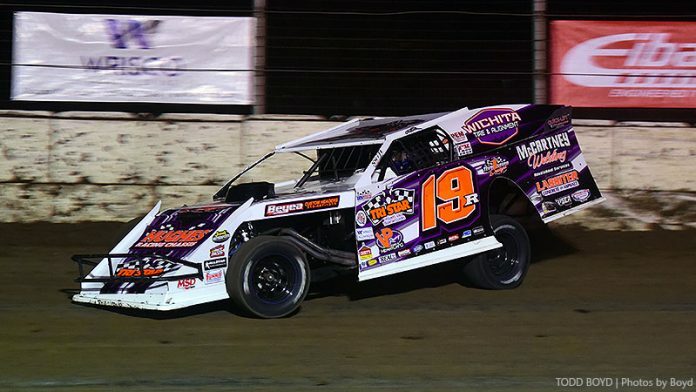 HUMBOLDT, Kan. – With arguably the best field of dirt modified racers ever assembled, Ryan Gustin stood out Thursday night in first-round qualifying at the King of America IX Modified Nationals powered by Summit Racing Equipment. A two-time past winner of the event, Gustin emerged as the only racer to capture both of his qualifying heat races. Gustin will roll into Friday’s qualifying session atop the points standings with two more heats on tap for each of the 72 entries at the Humboldt Speedway. B-Mods will award three provisionals (one each from IMCA, USRA and Wissota national points) from the pool of drivers that fail to qualify for the A Main on Saturday. A past champion provisional will be available for USMTS competitors.